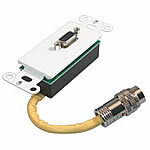 Rapid Run Flying Leads for VGA/UXGA connections to Computers, TV's, Projectors, etc. 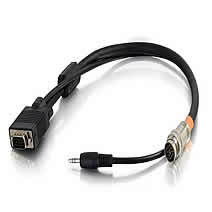 You simply snap one of the leads on the end of your matching cable and your connected! 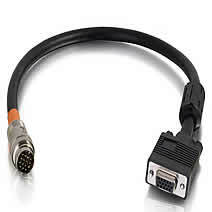 Ideal for use with computers, projectors, and any display requiring a HD15 connection. Giving you the highest resolution of 1600 x 1200. 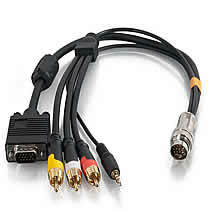 Use one Runner to simultaneously connect VGA video, 3.5mm stereo audio, and composite audio/video (3 RCA) signals. This Flying Lead is the perfect solution for educational and institutional installations. 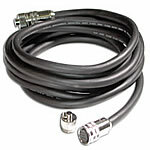 This particular Flying Lead cuts installation time and cost by allowing you to send PC Video, 3.5mm Stereo Audio, and Composite Audio/Video (3 RCA) over one cable. It is commonly used on the display (projector) end of classroom setups with the corresponding Wall Plate (#42320, #42313 or #42314) used at the teacher's station.